If The Wind Rises is indeed the final film from Hayao Miyazaki—the animation master has both announced and rescinded his retirement—he leaves us with a moving, meaningful farewell. Based on Miyazaki’s own manga, this Oscar nominee for Animated Feature Film plays the gentle notes of a Japanese countryside against the impending horror of World War Two, Miyazaki seeing it all through the myopic eyes of a budding aeronautic engineer. That engineer is Jiro, a young dreamer with his head in the clouds and his brain focused on the science of flight. As a school kid, he imagines conversations with the Italian engineer Giovanni Caproni (both he and Jiro are real historical figures), in which they speak poetically about the art of aviation and the allure of planes. Miyazaki pictures them standing side-by-side on the wing’s edge of Caproni’s latest invention, flying through blue skies. From the pair’s first fictional encounter, the film’s colors, tempo, and movements hint that we’re in for a glorious experience. And it’s no surprise that Miyazaki delivers on that promise. The most famous hand-drawn holdout in a world of rapid-fire 3D computer animation, Miyazaki imbues each sequence with an indefinable human texture, from wide shots of a destructive earthquake to simple low angles of a couple kneeling at their wedding. The director’s manual work, done with his now-legendary Studio Ghibli team, produces an intangible that most digital production can’t convey: elegance. Instead of the precise lines and infinitesimal detail of computer-driven design, there’s a delicate, flowing nature that ripples through The Wind Rises. Jiro’s desire to design a soaring spectacle lands him a job at the Mitsubishi factory in the late 1920s, where compliant Japanese engineers work feverishly on a better, lighter Naval bomber. Jiro is better than most, and is soon traveling to Germany to examine their technology and chase their mechanical superiority. Of course, we know where all this endless effort is heading, but the Japanese workers seem to not get it, or not care. At one late-night lecture, Jiro suggests that his latest creation will be light enough if they just remove the weaponry—an earnest comment met by roars of laughter from his colleagues. Miyazaki has been criticized for glossing over the reality of Japan’s role in the war; but by keeping Jiro laser-focused on his planes’ performance rather than purpose, Miyazaki keeps his protagonist naïve—and necessarily likable—staying right within the romantic tone of his film. The time period lets Jiro question what the future holds, even wondering aloud which countries might be attacked by the bomber planes. And if there were any doubt as to the devastation to come, a late scene in the film shows scorched earth and shattered planes (even if they are all Japanese), with a confirmation that every pilot involved met his death. 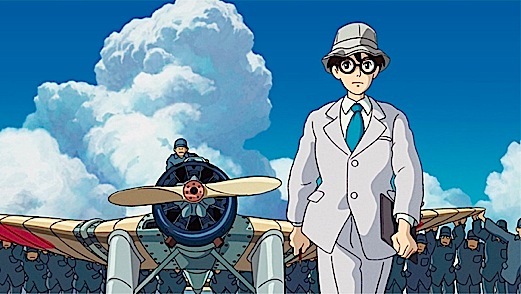 To apply a more aggressive, obvious statement against war would be far out of context.The Wind Rises is really a love story, with its conventional epic timeline uniting Jiro with Nahoko, a girl he once met on a train and who, it would seem, he is connected with forever. This is where Miyazaki turns sentiment into sentimentality, where we get melodrama that would feel right at home in a soap opera. But when Jiro and Nahoko playfully float paper airplanes to one another, the love story soars, the simple, law-defying models acting as a metaphor for romance itself. This is Miyazaki, always finding the beauty.